The Standup Football Screw lock Jig Head is designed to present the hook at the perfect angle, allowing your crawfish bait to be featured in a defensive posture, or your baitfish style bait to be featured in a downward feeding position. The flat portion on the front of the head prevents snags. 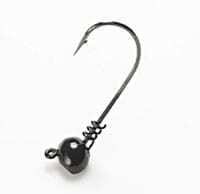 Gamakatsu 60 degree sproat style hook and a screw lock keeper to secure your bait with out glue allows you to catch more fish using less baits powder coated and baked for durability. This head is perfect for dragging 3.5-4.8 swimbaits, large spider jigs and worms or stuff it in your favorite tube to mimic a goby. Our staff is looking forward to talking about our experience with the Screwlock Stand Up Football Head, how it differs from other jig heads and the best way to fish it. Buy online, stop in the store or give us a call at 973-835-2966.